We survived Daylight Savings! Let's have some ice cream. (let's have some ice cream and booze). Last Friday night, I got together with some of my favorite Houston food bloggin' and food-lovin' ladies (Claire, Erika, Renia, Renee, Sarah, and Kyle), and we did a tasting at The Tipsy Dessert Bar, located in Rice Village. 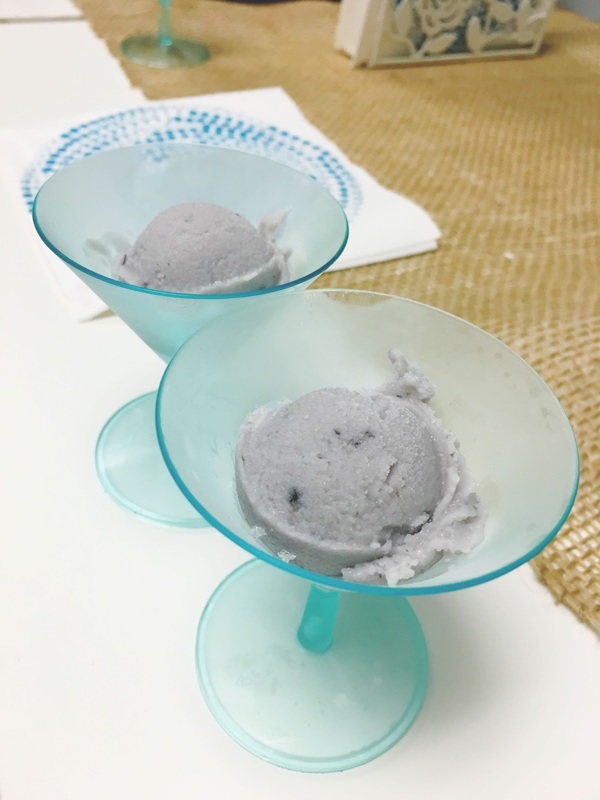 The Tipsy Dessert Bar offers dairy-free (read: vegan) ice cream made with coconut milk, and infused with alcohol. A tasting of four different flavors will run you a mere $15 and guarantees a delicious and ever-so-slightly tipsy result! Bri - a former chemist - is the brains behind the whole operation. Her adorable little shop is tucked away on the second floor above The Gorgeous Gael. 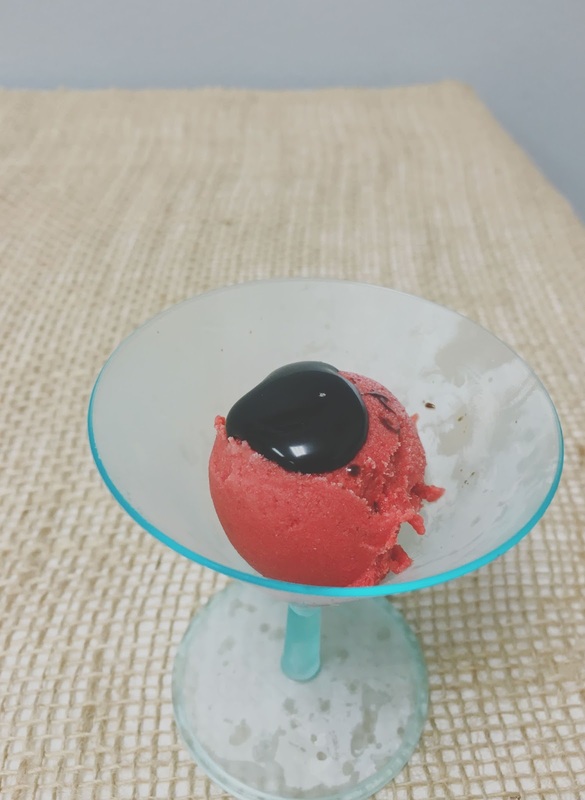 The first tipsy dessert we were presented with (and one of my favorites!) was the red velvet cake, made with cake vodka. This was sinfully delicious. The chocolate syrup was rich and went perfectly with the creamy, velvety (for lack of a better word) red velvet ice cream. The cake vodka (1/2 a cocktail-sized shot of alcohol is included in each sample!) provided a bit of a punch, but it was not overpowering at all. The next tipsy dessert was the blueberry muffin-tini, made with blueberry vodka. This tasted exactly like a blueberry muffin, right down to the teensy bits of actual blueberries thrown in! It was fragrant and slightly floral, and the alcohol was way more prominent in this one! Next up was the apple pie, made with crown royal apple. The apple pie was tied with the red velvet cake as my favorite tipsy dessert. The caramel was pure, silky, liquid gold. Combined with the crown royal apple, it was absolute decadent heaven! 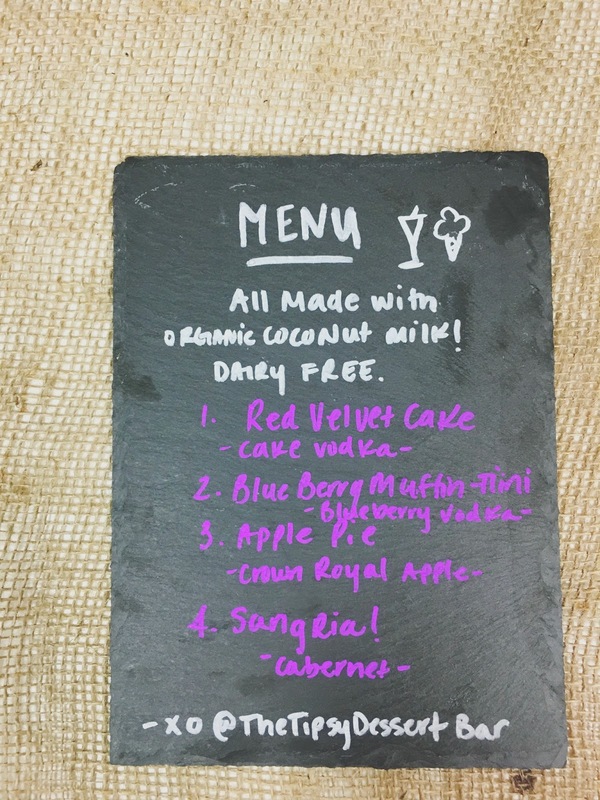 Our final Tipsy Dessert Bar sample of the evening was the sangria, made with cabernet. 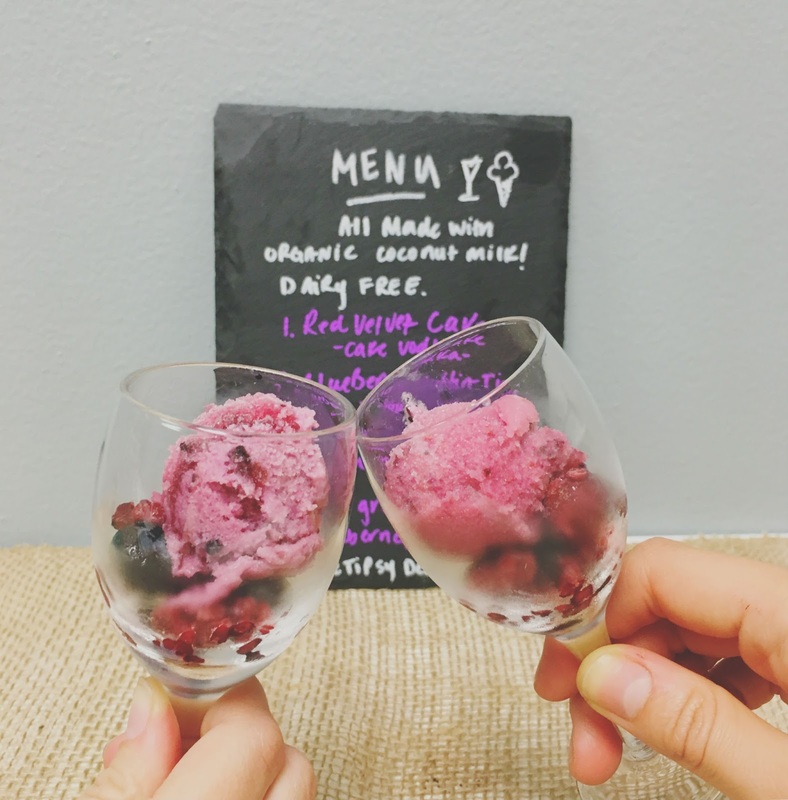 The sangria ice cream, which included fresh berries, tasted exactly like sangria (just in frozen form). It really was uncanny. Much lighter than the previous tipsy desserts, this was a wonderful way to top everything off! 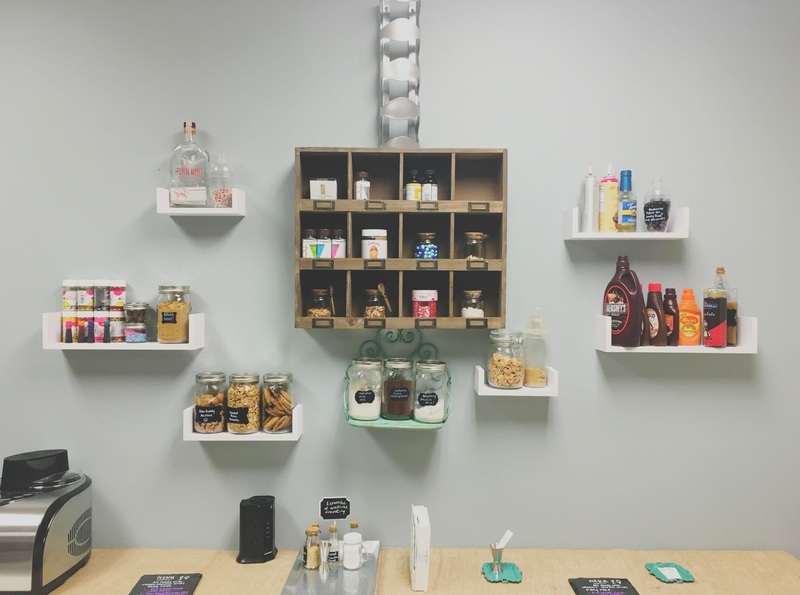 Not your average bar, The Tipsy Dessert Bar is a fun, unique spot in Houston. I definitely recommend trying a tasting with some friends or while on a date. Bri is incredibly communicative and helpful, and she'll get you all set up for an enjoyable time! 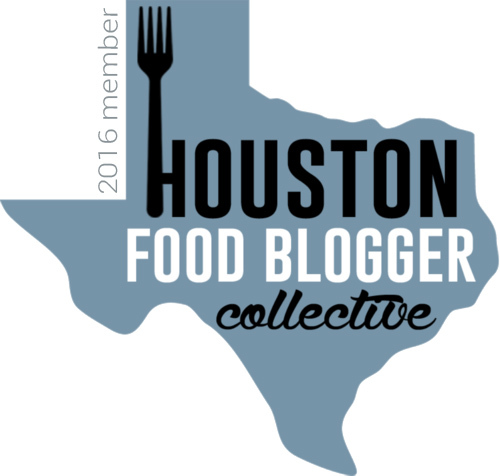 And fun fact, The Tipsy Dessert Bar is one of the featured restaurants in the 2016 Houston Press Menu of Menus® Extravaganza, which I am partnering with this year! The Menu of Menus® Extravaganza, presented by Stella Artois, is one of Houston's largest food & wine events, featuring over 40 area restaurants alongside wine, beer, and spirit sampling. The event will also feature the 5th Annual Iron Fork Chef Competition. The Iron Fork competition will showcase two of Houston's most popular up-and-coming chefs as they face off in a head-to-head cooking competition that will be judged by local area celebrities. The winning chef will receive the "Iron Fork" award and bragging rights for the next year! During the exciting cooking competition, guests will enjoy cocktails, wine, and food sampling from a number of the city's best restaurants. Tickets to the event include food and drinks for the evening. One lucky Adventures in a New(ish) City reader will receive two (2) general admission tickets to this year's Menu of Menus® Extravaganza, held at Silver Street Station in Houston on Tuesday, April 5, 2016, from 7:00 - 10:00 pm. To enter, go to the giveaway box below, and log in with your name and email address (this will not be posted publicly). Once logged in, click the "Enter Contest" dropdown, and then the "Enter!" button. One entry is allowed per person, and only Houston-area residents are eligible. The contest starts NOW - Tuesday, March 15, 2016, and it ends on Sunday, March 20, 2016 at 11:59 pm CST. **Bonus: If you like my Facebook page, follow me on Instagram, and/or follow me on Twitter, you get a bonus entry for each social media follow. Just click the dropdown on "Like Facebook Page", "Follow on Instagram," and/or "Follow on Twitter," then click "Enter!" for each one that you follow! This is applicable for existing followers, as well as new ones. 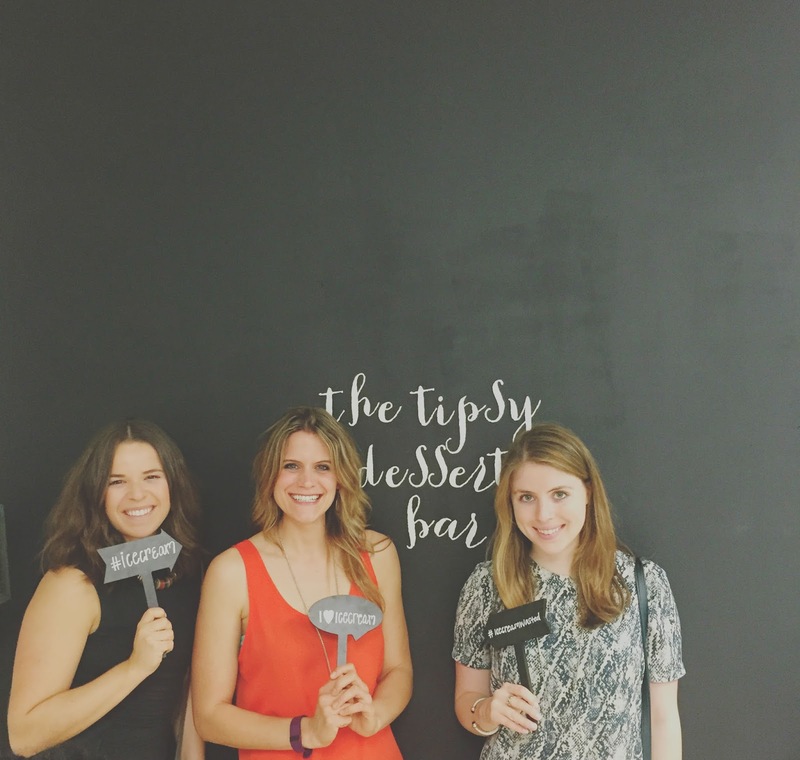 This is a super fun event (check out my post from last year), so you don't want to miss out! The winner will be drawn at random and announced next week - Good luck! 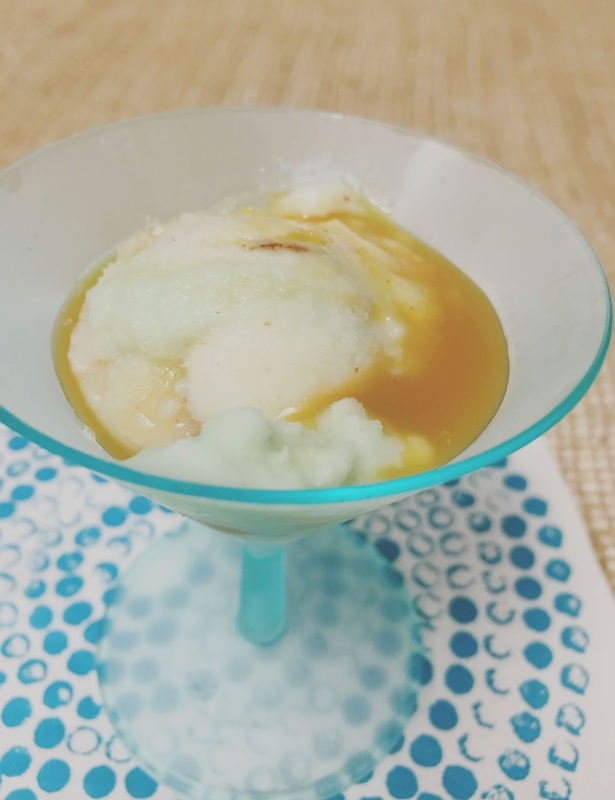 I must try all the boozy ice cream creations!! !